So lately I've been back into doing my eye makeup everyday. For a while I was just doing foundation, lipstick, and blush. I'm in love with my Urban Decay Naked palette and my eyeshadow palettes from Sugar Pill. So as you will notice a lot of my EOTD's for a while will probably be from these two brands. 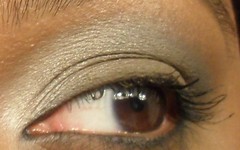 I'm wearing Sugar Pill eye shadow's in Tako & Afterparty as well as Bobbi Brown Steel. This is how it looked further away. I used MAC's Texture eye shadow as my highlight so you probably can't tell in the picture since it's neutral on me. I used Urban Decay Virgin mixed in with a Too Faced shimmery white eyeshadow in the corner, UD Buck on my lid, and on the outer corner, I'm not sure. I think it's Bobbi Brown Steel or UD Creep. And in all these pictures my eyeliner is always Urban Decay 24/7 liner in Zero and Clinique's High Impact mascara. 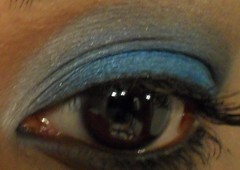 I really love the blue smoky eye! Its really pretty! How do you like Bobbi Brown cosmetics? I've always wanted to give them a try.